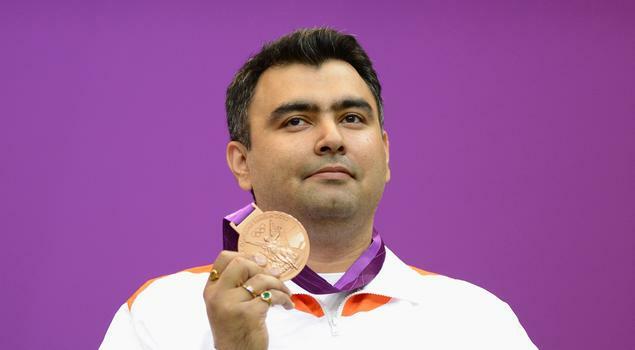 Share your wishes to the 2012 Olympics First Indian medal winner Gagan Narang here. Beijing Olympics gold medalist Abhinav Bindra is sent out of the London Games by failing to qualify for men's 10-metre air rifle final while Gagan Narang made it with an overall score of 598.Narang was one of the top eight shooters who qualified for the medal round. 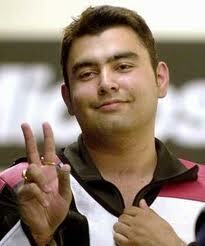 Gagan Narang's family hails from Panipat in Haryana, India. Later on his family shifted to Hyderabad. 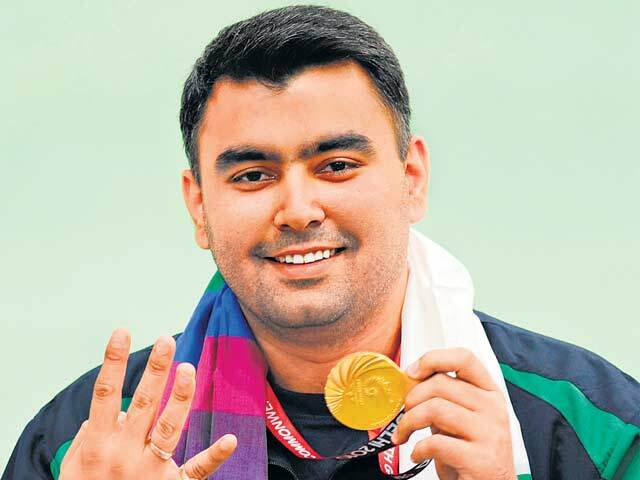 Gagan Narang added 4 gold medals to the Indian tally at the recently concluded 2010 Commonwealth Games in New Delhi. In the Men's 10 m air rifle singles event, he shot a perfect 600 which was a new record. Gagan also clinched a silver medal in his pet event at the Asian Games 2010. He also combined with Abhinav Bindra and Sanjeev Rajput to provide the country with another silver, in the team event behind champions China. Both of his silvers were won on the opening day of Asian Games. 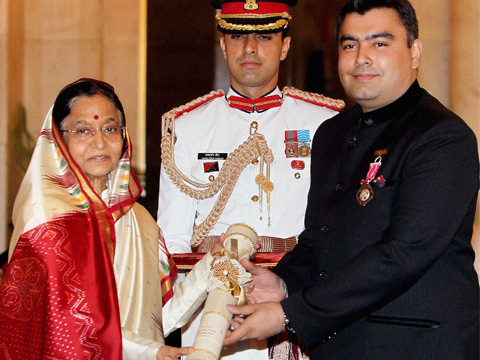 Gagan Narang got both Padma Shri and Arjuna Awards. 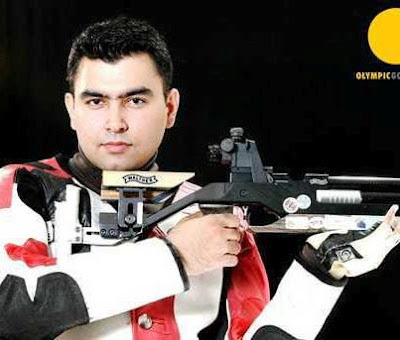 Gagan Narang is currently supported by Olympic Gold Quest. Find below the Bio-Data of Gagan Narang as specified in Olympic Gold Quest Profile page. And, Olympic Gold Quest Website has mentioned below things as Gagan Narang's Major Achievements. Updates: India's Second medal is the Silver medal won by Vijay Kumar. Google is showing one new Doodle everyday for the London 2012 Olympics. It seems Google will continue showing the Doodles till the end of London Olympics Games. July 27th 2012- The First Doodle is for representing the Opening Ceremony. July 28th 2012- Second Doodle is dedicated for "Archery"
July 29th 2012 -Third Doodle is featuring "Diving"
July 30th 2012 -Fourth Day Doodle is featuring "Fencing"
July 31st 2012 -Fifth Day Doodle is featuring "Artistics Gymnastics Men's Rings"
August 1st 2012 -Sixth Day Doodle is featuring "London 2012 Hockey". August 2nd 2012 - Seventh Day Doodle is featuring "London 2012 Table Tennis"
August 3rd, 2012 - Eighth Day Doodle is Featuring "London 2012 Shot Put"
August 4th, 2012 - Ninth Day Doodle for "London 2012 Pole vault"
August 5th, 2012- Tenth Day Doodle is featuring "Synchronized Swimming". August 6th, 2012 - Eleventh Day Doodle is featuring "London 2012 Javelin". August 7th, 2012 -Twelfth Day Doodle is featuring "London 2012 Hurdles" (This is first animated Doodle for the "London 2012 Olympics"). August 8th, 2012 Day 13 Doodle is featuring "London 2012 Basketball" (This is second animated Doodle for the "London 2012 Olympics"). August 9th, 2012 Day 14 Doodle is Featuring "London 2012 slalom canoe"(This is third animated Doodle for the "London 2012 Olympics"). August 10th, 2012 Day 15 Doodle is Featuring "London 2012 Football" (This is fourth animated Doodle for the "London 2012 Olympics"). August 12th, 2012 Day 17 Doodle is Featuring "London 2012 Closing Ceremony". If you haven't viewed the awesome Opening Ceremony you can watch London 2012 Olympics Opening Ceremony Videos now. And, watch below the Videos of Google Doodles shown for the 2012 London Olympics:, Or you can refer this playlist showing all Doodles. The below video shows the Google doodle Shown for the Opening Ceremony of London 2012 Olympics. The Second Day Google Doodle is for "Archery"
And, the Third Doodle is for "Diving"
Fourth Day Doodle is Featuring "Fencing". Fifth Day Doodle is featuring "Artistics Gymnastics Men's Rings"
Sixth Day Doodle is featuring "London 2012 Hockey". Seventh Day Doodle is featuring "London 2012 Table Tennis"
Eighth Day Doodle is Featuring "London 2012 Shot Put"
Ninth Day Doodle for "London 2012 Pole vault"
Tenth Day Doodle is featuring "Synchronized Swimming". Eleventh Day Doodle is featuring "London 2012 Javelin". Twelfth Day Doodle is featuring "London 2012 Hurdles" (This is first animated Doodle for the "London 2012 Olympics". Day 13 Doodle is featuring "London 2012 Basketball" (This is second animated Doodle for the "London 2012 Olympics"). Day 14 Doodle is Featuring "London 2012 slalom canoe"(This is third animated Doodle for the "London 2012 Olympics"). Day 15 Doodle is Featuring "London 2012 Football" (This is fourth animated Doodle for the "London 2012 Olympics"). Day 17 Doodle is Featuring "London 2012 Closing Ceremony". Get Inspiration and Motivational Quotes from this Facebook Page. Watch below the videos showing High Lights of London 2012 Olympics Opening Ceremony held on July 27th, 2012 in London. And, get Inspiration and Motivational Quotes from this Facebook Page. NOTE: It seems IOC is blocking the display of the Olympics Videos in Websites, so you need to click the YouTube link to see these Videos in YouTube itself. And, you can watch the last video in this blog itself. i-e These videos will show below message after clicking Play button. This video contains content from International Olympic Committee, who has blocked it from display on this website. I couldn't understand why IOC should provide Embed code in YouTube if they are not allowing embedding videos in other websites. And, I just prepared a few minutes highlights by recording only very few shots in these videos, as I thought taking few screens from the IOC videos won't violate their copyrights. But I got below message from youtube immediately after uploading the video. Your video may have content that is owned or licensed by International Olympic Committee. As a result, the video has been blocked on YouTube. This claim is penalizing your account status. So, I immediately deleted the video. I couldn't understand how people can see the fast track highlights of the opening ceremony if they don't have enough time to go thro' all the videos uploaded by IOC. Do you think that this behaviour of IOC is appropriate? Or, Am I not understanding the copyrights properly? You can Share your thoughts thro' the comments. David Beckham and Sir Steve Redgrave bring the Olympic Torch to the Stadium. Olympic Cauldron is lit at the Olympic Stadium for the London 2012 Olympic Games. The Queen Elizabeth II opens the London 2012 Olympic Games at Olympic Stadium, London on 27 th July 2012. The Olympic Oath is made from the Olympic Stadium at the Opening Ceremony of the London 2012 Olympic Games. The Search Engine Google is continuously updating their search algorithms so that users can see high quality and relevant search results at top positions in the Search Results page(SERP). Google strongly believes that giving high quality results is the only way for leading the Search Industry. But many Black-Hat SEO people were following black-hat tactics for bringing their low quality webpages at top positions of Google Search Result page. Recent Google updates were found success in forcing these kind of Black Hat SEO people to stop their Black-hat SEO tactics. The recent algorithm changes named as Panda update and Penguin update are playing significant role in suppressing Black Hat SEO. Google Penguin update is aimed at decreasing search engine rankings of websites that violate Google’s Webmaster Guidelines by using black-hat SEO techniques such as keyword stuffing, cloaking, participating in link schemes, deliberate creation of duplicate content, and others. Google Panda update is designed to reduce rankings for low-quality sites—sites which are low-value add for users, copy content from other websites or sites that are just not very useful. At the same time, it will provide better rankings for high-quality sites—sites with original content and information such as research, in-depth reports, thoughtful analysis and so on. Panda is a site wide penalty. i-e If few pages of your site were flagged for having thin content, your entire site could be penalized. So, Panda and Penguin updates force the webmasters to create websites with high quality content for the users and force them to follow Webmaster's guidelines given by Google. Now, let us see how to improve Search position while we know that getting backlinks forcefully will bring the risk of Penguin update. I have heard that the search engines started giving importance for Social Media Sharing. i-e Similar to number of Back links, Google is giving importance to Facebook Shares, Facebook likes, reddit upvotes, Diggs, number of retweets, etc. So, it is better to improve the Social Media presence of webpages instead of spending more time on traditional SEO steps. Let me discuss more about effectively utilizing Social Media in coming blog posts. How exciting it would be to meet people of similar interests, living nearby or around you. Glancee is the answer to such an inquisition, which allows people to meet and share their interests. This application is expected to be the next big thing in the world of social networking. Its popularity has mounted since Facebook’s acquisition of the application. Glancee has proved to be an invaluable addition to its mobile apps. With the $1 billion acquisition of Instagram, combined with Glancee, Facebook has a huge success on the mobile platform already. TechCrunch has reported that Facebook has hired Glancee’s three founders and has also purchased its technology. The current mobile app of Facebook allows the user to “check-in” to various places. But with the addition of Glancee - an app for iPhone and Android, Facebook would be able to advance its mobile platform further, similar to that of its digital platform. The implication nthen is that it is acting similar to cell phone monitoring software, that is it can help track and monitor activities of the user. There are always two sides to the story. In this situation, Glancee could face an issue as it relies on real-time data – in practice of communicating with cell phone towers, which uses too much battery. Another major issue is the privacy concerns, which ties in to almost every app available in the market. The upside of Glancee is that it blends the tastes of different people, searches for people with similar tastes, likes and dislikes. It is evident that this app is going to be one of the users’ personal favorites. However, a word of caution for the users who are very particular about their privacy – they shouldn’t use Glancee, as the app makes personal details accessible to other users in the first place. Glancee provides an opportunity to shy and reclusive people to talk to or bond with people they like. The app connects people by suggesting and sharing information about people who share similar tastes and allows them to initiate a conversation and get familiar with each other. People who are not comfortable having face to face conversations with others find Glancee particularly useful in connecting with like minded people. Cell phone monitoring has been going on for a long time, but it is necessary that are aware of this activity being carried out by application developers, who try to obtain user information to improve their own applications. They want to understand the user, their demands and expectations from the apps and the money they would be willing to spend on an app. Keeping this in view, Glancee does not seem to be a ground breaking application. Nevertheless, what is undoubted is that Glancee is all set to redefine phone monitoring as we know it in the social networking world. 1. Skip the nOt So Gr8t StUfF: You are not a teenage girl who collects Justin Beiber posters or your exes overly kindergarten teacher-y new girlfriend. Whatever you do, do not write in a strange font or mess with the caps lock button. A huge turn off. Leave your numbers out of your words and spell them correctly with the appropriate vowels and consonants. 2. Unique: Be different and mix it up! Stand out from the other billion users online. Have a weird hobby? Like a strange quote from a strange celebrity? A weird nick name? Anything, something, just be unique in your bio. Make it interesting. 3. Short and simple: No one cares about your life story in your bio. They want to know who, what, where, when, how and why. Keep it short and simple. You are lucky that Twitter only gives you a certain amount of characters but as for the other social media platforms you have free range, type wisely. 4. Actions speak louder than words: If your profile bio states that you are a lover of all things potatoes and cute kittens. You better believe you better have some sort of post of cute kittens and potatoes. Your bio tells your viewers what you are all about; it’s the first impression and introduction. With that said if your bio states you like to go skydiving, we know you won’t be able to do that daily, so keep in mind you need to live up to your bio. 5. Too many links: People find it their time to post every link possible in their bio. Huge turn off to viewers. Too many links in your bio can make you look like a spammer or someone who will just later send me junk email. Keep it clean and stick to one link if possible. Your bio is your first word to your viewer, how and what you say can gain you a follower or lose a fan. So choose your words wisely but have fun with it! Kelsey is the editor in chief for findananny. She loves to write article and ideas that parents & nannies would be interested in hearing. She helps society on giving information about nannies through nanny needed. She is a professional writer & loves writing on anything. Reviewing Our Plans .... and, changing the priorities... Going to make TheQuotes.Net as Most viewed Motivational Quotes Site. In January 2011, I had listed below things as To Do List. As of now, I am thinking about doing below tasks. I have listed them without any specific order. It may change based on further analysis. - Releasing an eBook about Web development. - Including hot trends in QualityPoint Twitter application. - Enhancing QualityPoint SEO Tools. Especially improve performance of keyword position finder and release a new feature frequently in domain analysis Tool which will be released in few days. - Improving internal email marketing Tool and releasing it for public also. - Adding New topics in Software Testing eBook. - Running contests for promoting Time sheet sales while creating awareness about Time Management. - Releasing our internal Affiliate marketing software to public also . - Improving the integration between QualityPoint Forum and other QualityPoint Applications. - Releasing internally using scripts such as "failed email collector" and any other cURL based scripts. - Developing Job search engines with own crawling and indexing of data. - Enhancing product sales pages. - Converting existing scripts into wordpress plug-in. - Adding more products in our products page, and releasing them in the form of wordpress plug-ins also. - Introduce Mobile friendly version of our websites. - Doing more analysis about effectively using Google AdWords. - Developing Social media marketing Tool. Initially we will include the social media sites which attracts more traffic and provide APIs. Later we will include more social sites step by step. - Adding more topics and content in our Quiz and Easy learning. - Tuning "Most viewed" feature of our social bookmarking site. - Tuning the NewsBot content of our Social bookmarking site. - Enhancing AutoTweet feature of our Twitter application with more functionality. - Creating Video Demo for all our products to explain them to the users easily. - Integrating Inventory module with our Time Sheet script. - Creating facebook applications to promote our easy learning game and Quiz. - Taking steps to hire skilled engineers who are interested in joining with us to develop products that can dominate the world IT market in coming decade. - Improving look & feel and navigation in our all our sites and blogs. - Including our Social bookmarking feature in all link sharing services such as AddThis, AddToAny, etc. - Releasing many new Twitter based apps. apart from our already released applications. - Automate the Press release process. - Managing QualityPoint Group in LinkeIn effectively so as to attract more members. - Enhancing our Affiliate management software. - Effectively using cURL for doing data extraction and auto posting to enhance and promote our products. - Systematically avoiding time wasting clients so that we will have enough time to spend for our genuine clients and for developing our own products. As part of this effort I am going to increase the upfront payment percentage so that only the people having clear requirement details will approach us. - Develop our smart News reader script further by adding more finance news sources apart from yahoo news. - Introducing Language changing option to few of our products. Currently plan to use Google translate to create the language specific files. In future we may tune them manually also. - Effectively using great experience and knowledge gathered by our Team while developing a web application for automatically posting resume to more than 70 US job sites for our client. 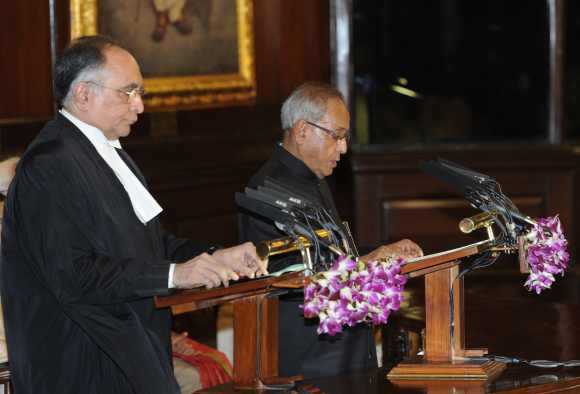 We will use this experience to develop similar tool for Indian market or UK market. Or, we will be developing a Tool for allowing the users to automatically post their links to lot of directories and search engines. We have done few things in this List, and few of them are in Pending state. And, most of the items in this list are not yet started. And, I am planning to postpone the pending Tasks in this list for few more months or years. Because, most of the items in the list require skilled and experienced employees, and many tasks will take many months or years. But, we face high employees attrition rate. As a Start-up, retaining skilled employees for long time is difficult. In fact, I don't want to retain them forcefully(e.g Bonds). Because many corporates offer good salary which is much more higher than ours. So, I believe allowing our skilled employees to leave our company to join corporates will be the appropriate action I can do by considering welfare of them. And, it will help us to get new employees as they beleive joining our company will surely help them to reach corporate companies with good salaries in few months. But it heavily affect our company from many perspectives. We used to spend lot of time and energy in training our new employees for many months so that they can start doing web development (php/mysql/wordpress/jquery) projects that are listed in my list. And, I had seen that most of the employees started searching other jobs immediately after getting trained. The new employees will again take significant time to learn the things, and they will also leave after few months. So, I found difficulty in completing my plans. Since, the employees are leaving for higher salary, I had decided to hold these plans till the time where we too can offer the higher salary competitively. So, I had tried various other models. e.g developing small websites and selling them thro' Flippa, and doing SEO, publishing News, Resume submission service, etc. Among these different models, I found "Doing SEO" is most suitable for our company. Because the new employees can learn SEO quickly and they can start their work in few days. And, even if the trained employee is leaving the company, it won't do any harm as the knowledge transfer process for SEO task is simple comparing to the web development. Ultimately I found that high employee attrition rate won't affect us if we choose to do SEO instead of taking development works. So, I have decided to focus more on SEO. Anyway I will be continuing few web development activities for our own needs and for our long term customers. And, note that this is just an intermediate plan till we reach the time when we will be able to offer good salary to our employees so that they will be happy to work long term in our company. Now, let me explain my plans about doing SEO. Let me explain the reason why I chose "TheQuotes.Net". I believe the domain name TheQuotes.Net is valuable, SEO friendly and easy to remember. And, lot of people like to read motivational Quotes irrespective of their country or age. We can understand it by seeing the search volume for Quotes related keywords in the Keyword analysis tools. And, we need not add the content frequently, and the content added today will be useful after many years also. I have already done some initial on-page optimization for this motivational Quotes website. And, our Team has started promoting this website thro' social media also. We have created Facebook Fan page www.facebook.com/TheQuotesNet for this website. And, I am putting lot of efforts to make sure that our Motivational Quotes site contains only the inspiring Quotes. We are working on to create lot of Motivational Quotes Videos for promoting TheQuotes.Net thro' YouTube also. And, I have taken initiate to send Free SMS Quotes for promoting TheQuotes.Net. Our AutoTweet feature is attracting many users so that TheQuoes.Net will go viral. Already more than 700 people are using this feature. And, we are going to do lot of things to get quality backlinks. We are already doing Link Exchange. If you are interested we can add your link in this Quotes Sites. I understand the tough competition for motivational Quotes related keywords and the Low CPC for the Quotes related keywords. But I am still seeing the opportunity as the Search Volume is very high. You can come to know about this fact if you do little research on semrush.com for the Quotes related sites. So, I am holding most of our development works for few months till we promote our Quotes website site to reach top position in Search Engines for many motivational Quotes related keywords. I will update the progress in few weeks. I would like to make our TheQuotes.Net as Most viewed Motivational Quotes Site in few months. I believe win-win approach is the only way to achieve it quickly. So, I welcome any suggestions/plans from anyone to promote TheQuotes.Net as Win-Win approach. And, I had added lot of Motivational Quotes videos to this Videos page. And, I made it available only to the Fans of the Facebook page. i-e The Motivational Quotes videos will appear only after the user likes the Facebook page. I believe this new feature will be giving the unique advantage of being the Fan of our Quotes WebSite Facebook Page. As of now this Video page has many Motivational Quotes Videos, and I am planning to add more inspiring videos to this page. I welcome any suggestions to improve our Motivational Quotes Website Site further. We are continuously working on making our Quotes website TheQuotes.Net more SEO friendly and Social media friendly so that we can make TheQuotes.Net as World's Most Popular Motivational Quotes Website. And, therefore we are working on improving the Quality of the website and planning to add more inspiring Content. Let me know if you find any issue in loading/navigating our Quotes website "TheQuotes.Net". And, if you are a motivational Speaker I welcome your content if it meets our Guest Post Guidelines.